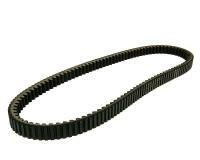 Aramid reinforced belt from well respected Italian company Dayco, sister company to Pirelli. The woven aramid fibre makes this belt much more durable than standard V-belts. Dayco belts meet the highest standard and are preferably used in Maxi scooters or motor scooters with higher capacity and power however can also be used as a replacement belt and are therefore a good choice for those who demand a little more than what the standard belt offers. This belt is suitable for HONDA Silver Wing 400 (06-) Maxi scooters.